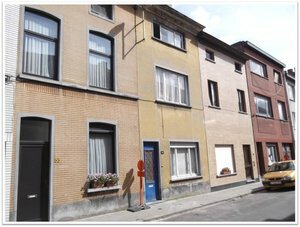 The neighbourhood of Sint-Amandsberg is a typical example of a 19th century belt which is common for many Flemish cities. These neighbourhoods are composed of small terraced single family dwellings that do not live up to current comfort standards and for which energy efficient refurbishments are highly necessary and the renovation rate needs to be increased. By refining the TABULA typologies for this neighbourhood, and by linking this typology to available energy metering data and resident typologies appropriate refurbishment strategies were calculated, both no regret and nZEB renovations. The results indicate that the current renovation rate needs to increase drastically and that focus should be on deep renovations.